They say role play is a great form of therapy. 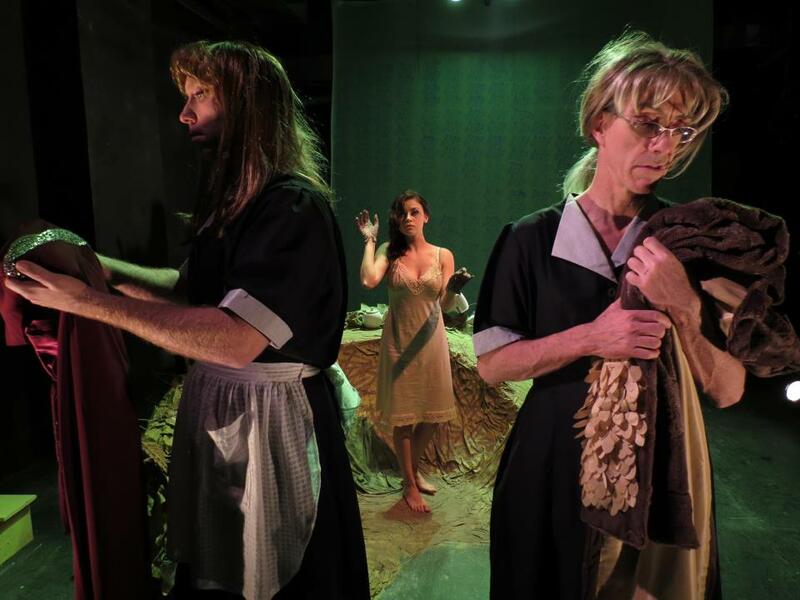 But in French playwright Jean Genet’s 1947 play, The Maids, this concept is taken to a whole new sadomasochistic level. Two maids, who also happen to be sisters, play out private, elaborate and deeply disturbing rituals where they take turns embodying the roles of “Madame” and “Servant.” “Madame” belittles “Servant,” yet “Servant” eventually overpowers “Madame” through cutting words and, ultimately, physical force. In Oracle theatre’s production, the freakishness is turned up several degrees by casting the two maids as men in uncomfortable drag. John Arthur Lewis is Claire, the younger, more rebellious sistermaid, and Rich Logan is Solange, the older, passively brooding sistermaid. Claire, who typically plays “Madame,” brings high powered intensity and grande, volcanic monologues about her life’s various upper class vexes, while Solange slinks in the back and calculatingly cuts “Madame” down to size. But when the real Madame (a deliciously over-the-top Sasha Grishkov) stumbles into the room, the sistermaids snap into subservient mode. To add some spice, Claire has been challenged to off Madame with poisoned tea. But Madame proves more elusive than they each anticipate. Oracle’s uncomfortably intimate production hones in on the deeply insular, claustrophobic and sickly co-dependent world of The Maids. Max Truax has designed a literal rats nest in the middle of the stage, made up of gowns, tea cups, sewing machines, wire hangers and other household whatnots that Claire and Solange continuously add to as their power play progresses. Elizabeth Lammer’s lighting design uses sharp angles and unexpected shadows to play up the drama of the shifting power. And Ben Fuchsen’s direction elevates Genet’s work with smart, symbolic blocking. While Genet’s overly wordy script proves exhausting at times, Oracle’s production is nothing short of fascinating. And, as a public access theatre, totally free. Though, donations are happily accepted. the maids are actually typically played by men! Really? Oops and fascinating. The research I did showed women playing the maids (production photos). I suppose it’s never explicitly stated in the play, but they’re supposed to be very masculine looking. Yes, it’s never stated they are men. And, in fact, some production photos I’m seeing, it looks like “Madame” is played by a man in some cases, with the two maids being female. And in the 1974 movie version (youtube it) the maids are women.